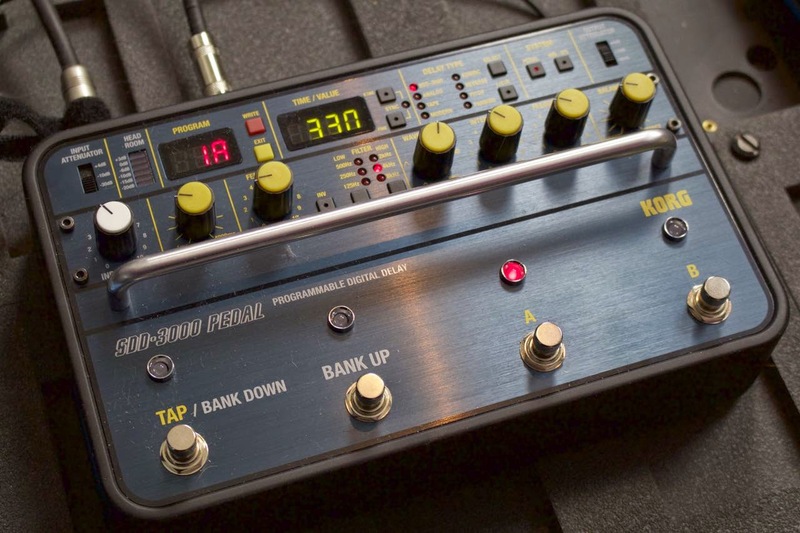 In 1982 Korg launched the Korg SDD 3000 rack unit and it became an almost iconic effect, not least because The Edge chose the pedal as his favorite. Now Korg has released a delay pedal based on the same functionality as the original and they have really succeeded in recreating its sound absolutely perfect. Totally flawless. I remember there was a guy who had a studio in my hometown and this guy had a SDD 3000. We used to sit for hours and play around with clean sound and it was just absolutely amazing. So when this new pedal came in my way I just had to check it out. A very cool thing about this pedal is the a preamp they have put inside, it puts an extra boost to the tonality. There is also an input attenuater which compensates for single coils lower signal compared to a pushier humbucker pickup. The preamp can be overruled if you don't like it. 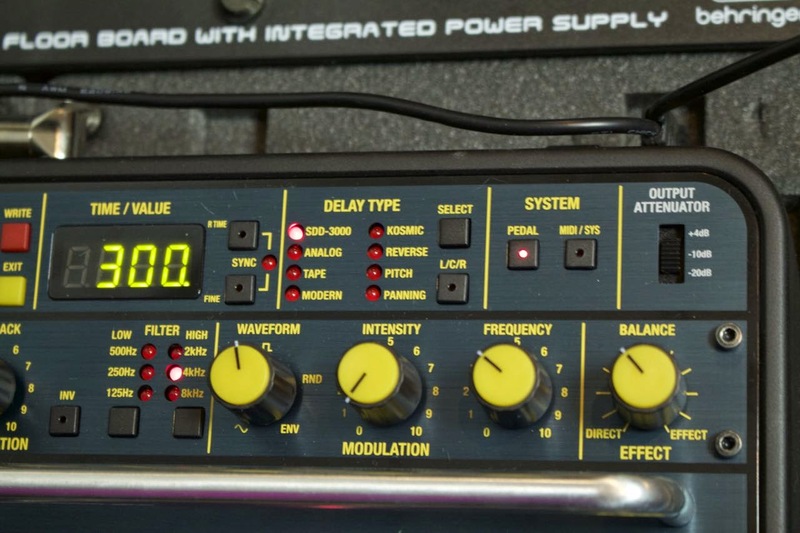 The second uniqueness is of course the SDD delay itself which is very true to the original rack unit. This delay is pretty much what this pedal is about. It may sound a bit geeky and corny but it's actually thoroughly good. I have not heard anything like this in any pedal out there, period. It´s musically warm and beautiful. The pedal is extremely useful in its simplicity and if you like complex pedals, it also contains basically everything you need without compromising on usability. There are another 7 different delays to, beside the original SDD delay, which is worth the money itself. It´s warm and not nearly sterile, even though it is digital. I will not go so far as to say it could easily replace everything on the market, there are many other fine delays out there, as the TC Electronics Flashback to mention one. For those who like buttons and loads of "dialing in" this pedal has a lot to deliver. One can, for example, save favourite sounds in 40 banks x 2 channels, ie 80 presets, probably enough for most people. All delays can be set with parameters such as waveform, intensity and feedback. SDD, the original from 1982. The best feature in this and it works for everything. Since you can save 80 locations, you can modify it as much as you wish. Yes there is actually one downside. On one hand you have 80 locations to save so your favourite sonds but you have to walk up and down in the 40 banks to find the right one and it's not very user friendly in a live situation. But on the other hand it is a luxury problem, its of course possible to organize it smart in the banks and reduce this downside. But the extremely beautiful SDD delay itself weigh this up, no doubt. Check out this sound sample below. The Box of Doom crashed in to the Zombie catacomb a while ago and I was curious above sanity about how well this thing actually isolate, how user-friendly it is and how it perform regarding sound quality. Those were actually my top three reasons for buying it in the first place. I wanted to complete my studio, located in a home environment. I unpacked is, mounted a SM57 and plugged in the amp and my computer and the truth is that it blew my mind from the very first seconds. To mice a guitar amp professionally without being disturbed of to high volumes at home and not to disturb the neighbours and my newborn daughter was my main goal. 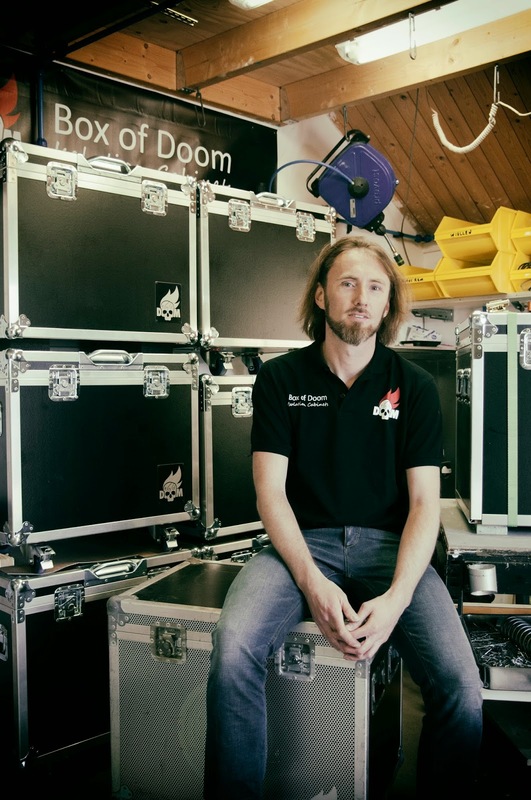 The Box of Doom is built by Sylvester Vogelenzang de Jong, you can read an interview with him here. 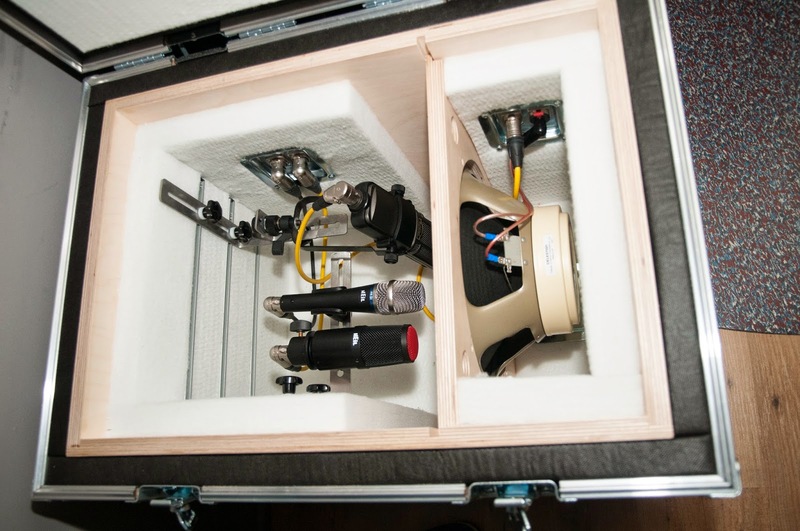 It´s technology is placed inside a very robust flightcase box. It´s a beautiful and heavy piece of sound art. The lid is massive and gives you a feel of how well built this isolation cab is. Its just screams quality in every little detail. Inside the Box of Doom there are 6 different absorbtion and isolation materials with "airchannels" placed like a labyrinth letting the air pass in and out freely. This is actually one of many reasons why this thing sound so honestly and well when used correctly. You can use up to three mices (XLR), placed in different positions to get the most out of your amp in a recording or a live situation. 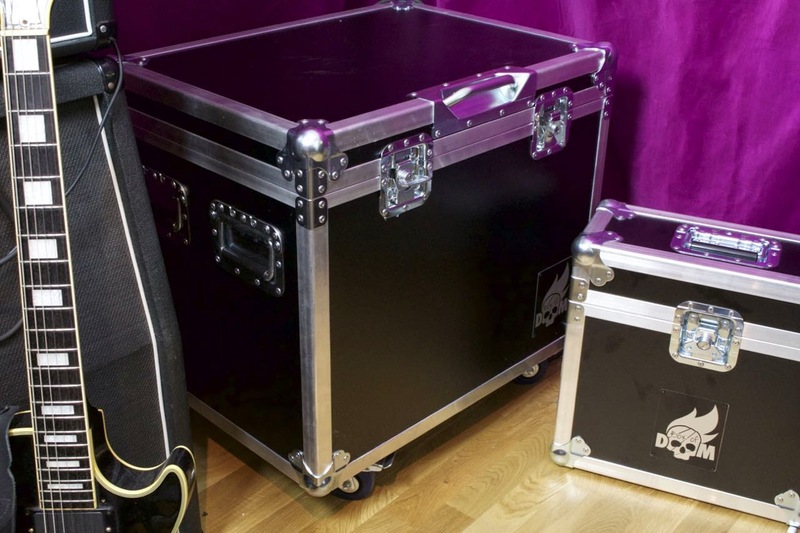 To use it in recording environment is of course the first you think of but many players actually use the Box of Doom live, and I am pretty sure the sound engineers will love this and stop harassing guitar players for playing to loud. They will also get themselves a very clean signal with zero bleed to work with. 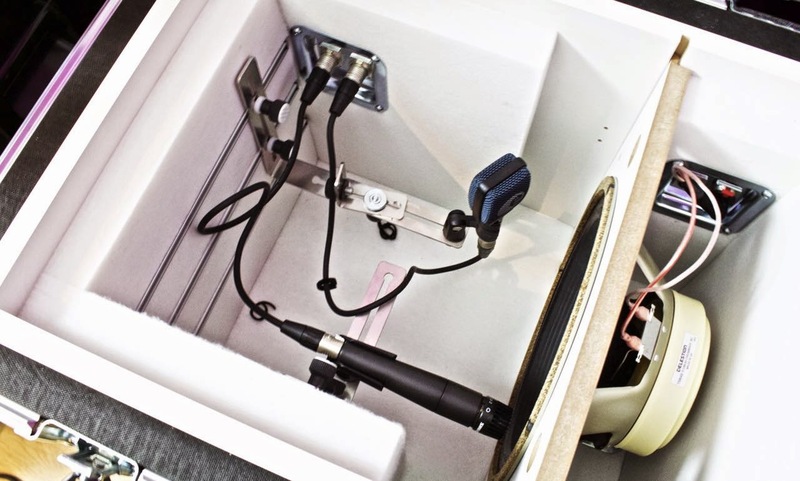 The mices are mounted in a ALLXs-system which let you posistion your mixes practically wherever you want with extreem precision and you can also leave them inside during transport and just plug the thing in when you get to your new location. This solution is very userfriendly and very stable. 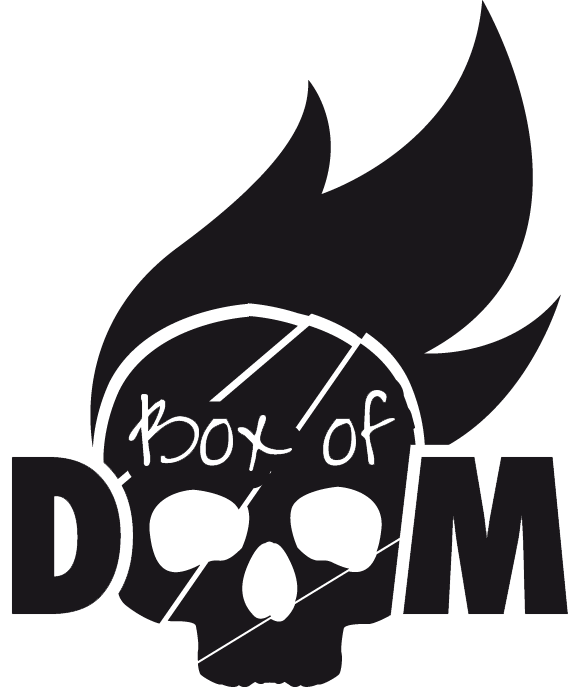 There is also an option to buy a Box of Doom with goose-neck, for those who prefer that. You can of course use whatever mices you want, but I had a SM57 and a Sennheiser e906 at home, which has a very similar behaviour. The best is to use mices with different characters. It´s a matter of taste with lots of opinions so lets leave it right there. Anyway, when I make an EQ analyse in Logic, I note that the guitar EQ lies in between the frequency 200-5000 Hz. A new friend of mine gave me this tip to check the quality of mices ability to deliver a guitar sound. This means that the Box of Doom behaves not only quiet but also acoustically very well. The result is like mixing a normal cab, which is not to say about many of the competitors. The guitar tone, if you have a great one from the beginning, stays great och very honest. You don't need to much at all with the EQ in Logic or at the mixing board. It´s very organic all the way and the amp sounds as it´s suppose to do. I´m a bit surprised by the fact that it is that easy to dial in whatever amp you want with a indisputable result. I made an EQ analysis in Logic and noted that the guitar lies stable between the frequencies 200-5000 Hz. A buddy gave me this tip for checking the quality of the equipment to deliver a good guitar sound. This means that Box of Doom is not only quiet but also acoustic schematically good . You do not need to tune very much at all with EQ i post production. It is in general very organic and the amplifier sounds as it is supposed to do. I'm a little surprised that it is so easy to dial in a good sound. The speaker is placed from the side and not at the bottom as in many other iso cabs. This means that you don't risk dropping a mice on the speaker during the positioning process and damage the speaker. The speaker is mounted in a cassette baffle system which means you can easily change speakers in a minute in the studio for instance, or even live of course. The two holes in the cassette is made to let air goes back and forth inside the box and contribute by itself as muck as the air channels inside to the character of the "sound". The extra speaker box, optional, is as robust built as the main box and you can order it containing one or two speakers and it´s easy to carry. You can choose different speakers, Celestion Creamback G12H 30 (Classic), Celestion Creamback G12M 65 watt, Celestion V30, Celestion Greenback G12M 25W and a EVM Electro Voice Classic 12L - 200 watt. These are all great speakers with individual characters. I ordered a V30 and a Creamback 65 watt speaker and I love them both. The Creamback is my favourite for now though, warm and tight but still a bit vintage. This is exactly what you want if you record musical stuff in a pro-studio, at home or if you´re playing live infront of an audience. The price is comparable to a high quality 4x12 cabinet like Mesa and it spare you many hours of trouble trying to mice an amp in any situation. A while ago I made a Rig Rundown with Fredrik Åkesson from the band Opeth. I discovered that he was using an isolation cab, a Box of Doom. Just like the guitarists of In Flames, Björn Gelotte and Niclas Engelin. Fredrik and the crew had just started to test this cab and they were obviously thrilled about the whole thing. 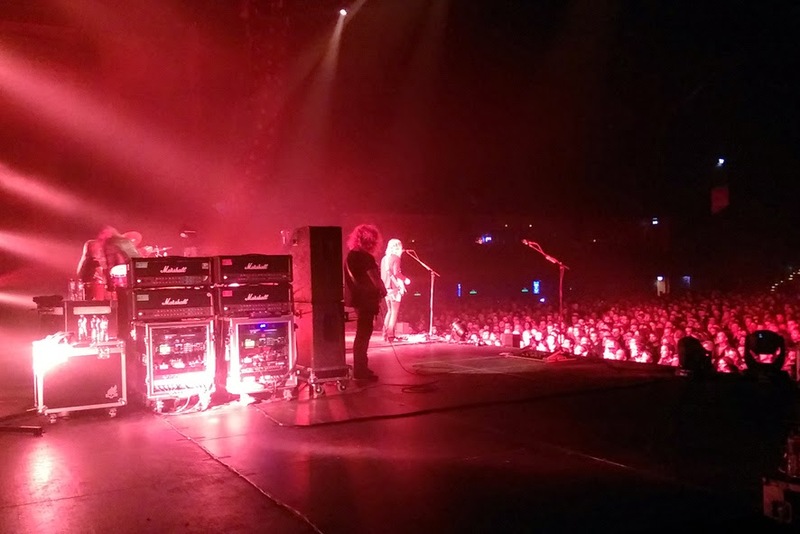 The following Opeth US tour inDecember 2014, with In Flames, Fredrik moved on with the Box of Doom and only used his "traditional cabinets" for stage sound and to achieve acoustic feedback in his playing. The iso cab is actually what you hear live nowadays. The same goes for the guitarists in In Flames. Iso Cabs are not a new phenomenon but it´s definitely a big trend that just started. The Box of Doom, created by Sylvester Vogelenzang de Jon, intergrates the mic and the speaker into a well isolated and acoustically neutral environment. The clear benefit is no bleed and interference from guitar, drum and vocal mics. And vise versa. The result is a very clean and dynamic signal in your studio or live mixing equipment. Another thing is that the amp can be cranked up a bit more, to get the best out of it, without having a noise issue on stage and where ever you play, you always get the same result. You are no longer reliable on the stage acoustics. Bands like In Flames and Opeth, leave the mics in the Box of Doom and roll them of stage straight into the truck. Next show they roll them on stage, plug in the XLR and amp and they are ready to go. There are a few iso cabs on the market today, I have previously written about a consumer product from the states, AxeTrack, which has its advantages, especially the size. Randall has one to, but much larger than AxeTrack, and what I´ve heard it doesn't isolate enough. It works, but not very well, is a common term from people. The Box of Doom, on another hand, is a "high quality isolation cab" built like a tank, which both isolates fantastically well (-29dB) and deliver what you always dreamed of in studio and in a live situation with your PA.
After some research I discovered that Sylvester Vogelenzang de Jong developed his "Doom Baby" from his own needs as a guitarist of the Dutch band Ulysses. 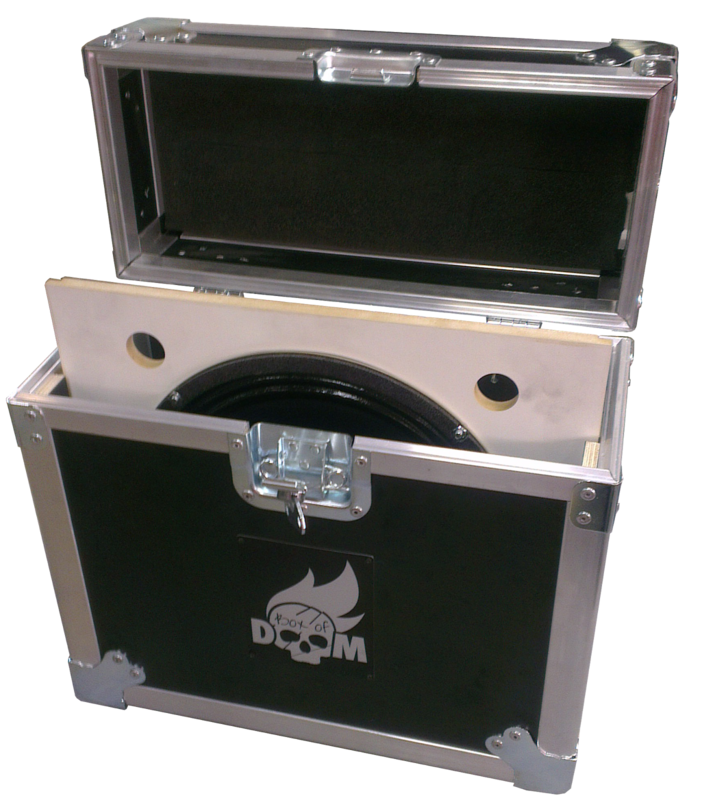 Today Box of Doom is a handmade boutique speaker solution made for live environments, pro-studios and home recording situations. All this information made me curious, of course, not least because I was looking for advanced technique that delivers a consistent sound reproduction when I test amplifiers, guitars and effects for The Guitar Zombie blog and YouTube. Home studio environments is a difficult world if you want to record with real amps, especially if you're located in a regular apartment. I contacted Sylvester and asked him if he was interested in being interviewed about guitar sound and how to use iso cabs in general and particularly the Box of Doom. What are the main reasons, out of your perspective, for guitarists to use an iso cab? In my opinion the best way to get a good guitar sound is by micing a speaker (preferably with multiple microphones) which is driven by a (tube) amplifier. An Isolation cabinet enables you to use the conventional setup (guitar, amp, speaker, mic) without the noise level the normal rig produces. Most guitar players only think about a isolation cab for (home) recording. 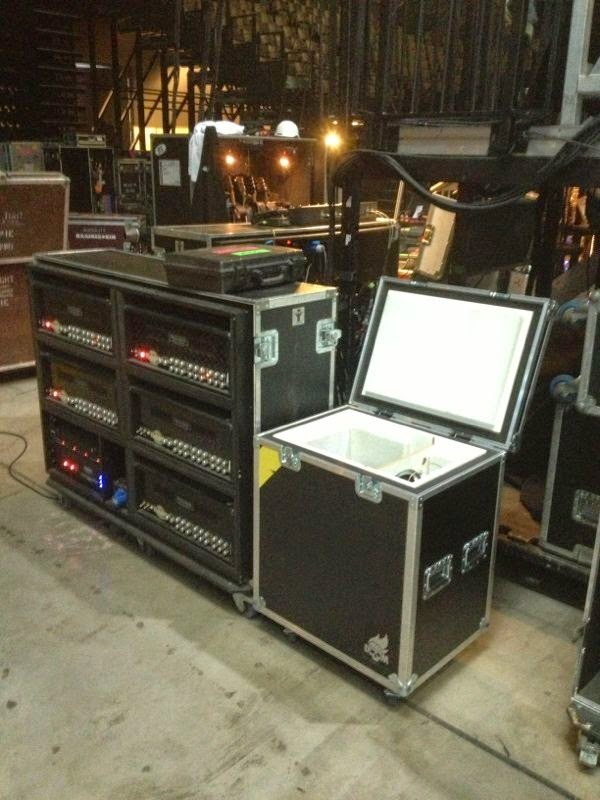 But an isolation cabinet is also very useful on stage. Lowering the stage volume makes the life of the front of house engineer much easier, and enables him (or her) to get a better balanced sound in the venue. How long has it taken to develop your ideas of a Box of Doom ? When did it all start? In 2008 I decided to record guitar tracks in my home studio. I tried all kind of modeling and plug-ins, but I wasn't happy with the result. Micing a cabinet was not an option, because I don't have a isolated studio. So I decided to build myself an isolation cabinet. Nothing new there, because hundreds before me had build some sort of isolation cabinet, or stuffed a cabinet in a wardrobe. The first concept, which I used for album recordings in 2008, was very simple, made of MDF and I used isolation materials bought at the local hardware store. It had only one microphone, placed on a goose-neck. It already had the extractable baffle, so I was able to change speakers. Further more, it was a DIY project. After we finished the album we did live shows with the band and I took the Iso with me, because we just started using in-ears on stage. 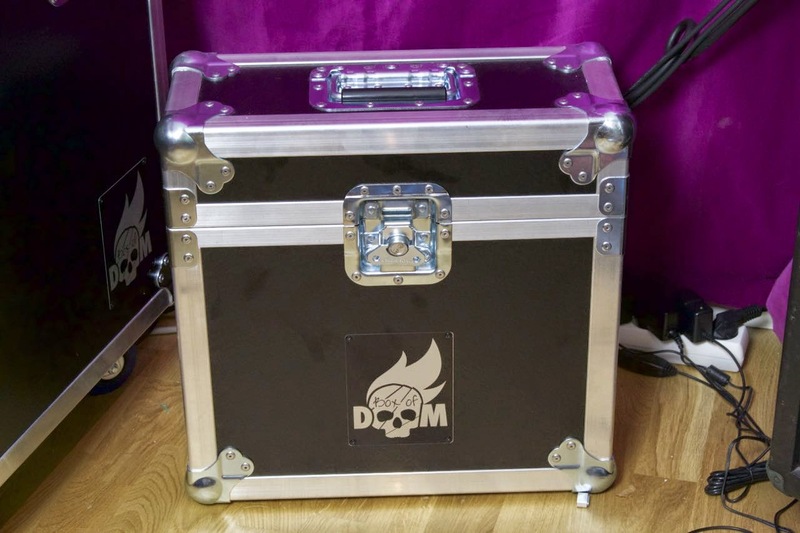 This version wasn't really fit for touring, to say the least, the box didn't even had wheels or grips to carry it on stage and soon got the nickname “box of doom”. So I started developing a new version, which resembles the Box of Doom as we know it now. How much did you change the contruction? I worked on the "box in box construction", searched for a better acoustic absorption materials, and constructed the flightcase. At this moment I didn't had any commercial intentions, I simply needed a better looking and more practical iso, which was much more silent and better sounding compared to the first version. And then people became highly interested? 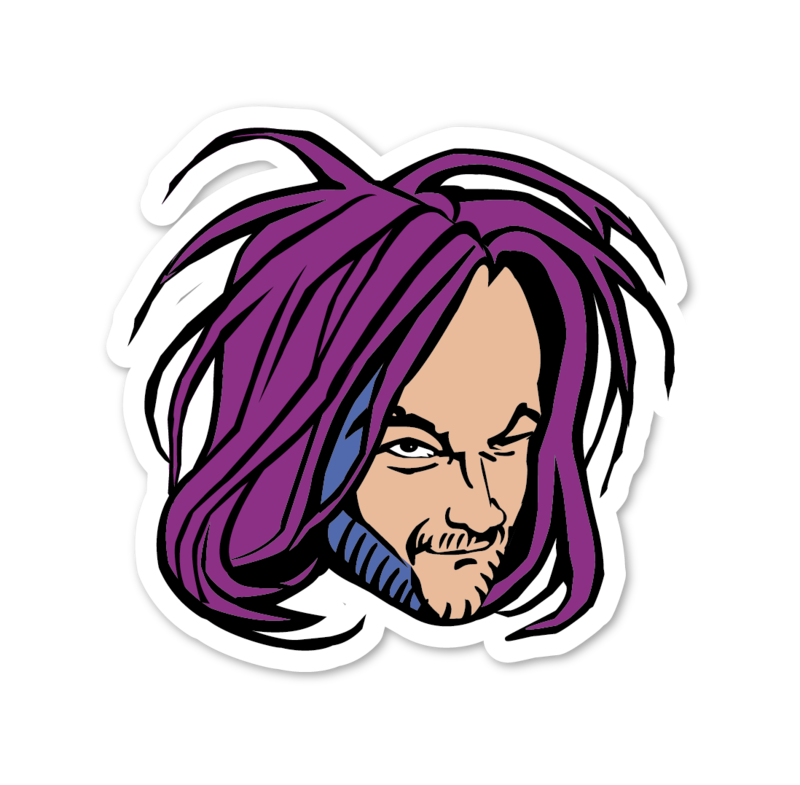 Yes, soon the news spread (sound technicians talked about it) and I was asked to build one for a guitarist working on a solo project and I sold my first BoD to him. I just made up a price to cover the expenses and thought that would be it. But to my surprise, after a few weeks I received a phone call from a very popular Dutch session player (Bert Meulendijk). He asked me to build him two units. One for at his home studio and one for live purposes. Not knowing he would use it on national TV, The Voice of Holland. The Voice of.. soon went global and until today he is still using it. Shortly after that, my phone rang again, and I got a request from the Wisseloord studio's (known for many world famous productions), asking for three Box of Dooms and a flightcase with alternative speakers. This was the moment I pinched myself and asked myself what the hell? It seemed I made something special, distinctively better than the Iso's available. As from this moment I gradually upgraded the Box of Doom with features making it more user friendly and versatile. Did you test the other ones on the market? No, when I build the first one I did not look around what was available, I just made a design that felt logical. After I noticed the Box of Doom was a “hit” I started on a commercial product, just then I checked out the competition. I actually didn't test them myself. In the meantime I had some customers who had done it for me, so I didn't bother anymore..
What is unique with the Box of Doom compared to the other ones? 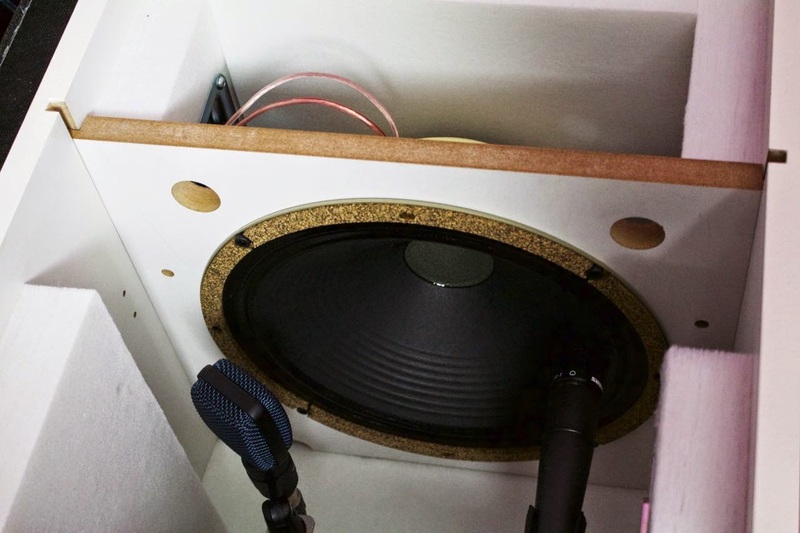 We use high end acoustic absorption and isolation materials, the BoD doesn't sound boxy. The speaker is mounted vertically (no risk of damaging the speaker, when you drop the mic..) and it can be changed in under a minute of your precious time. Easy access, huge lid that opens.. enables you to actually see how you position the mics from above. Three microphone connections if you like. No goose-necks, the AllXs system is solid system for pin point exact accurate positioning and it´s of course tour ready, no need for additional flightcase. What mices are the best to use for clean and dirty, and why? Since we have a growing customer base, we have a lot of feedback on user experience. I always try get information on amps, mics etc used by the users. I am always interested in combinations that are less successful, so we have something to focus on. To my surprise, all kind of mics work well in the Box of Doom. Large diaphragm, Condensers, Tube mics, Ribbons you name it and it is used by our customers. Do you have any customer examples? Rammstein uses a very large Lawson tube mic. On stage they always had difficulties with environmental influences, risking to damage the mic. 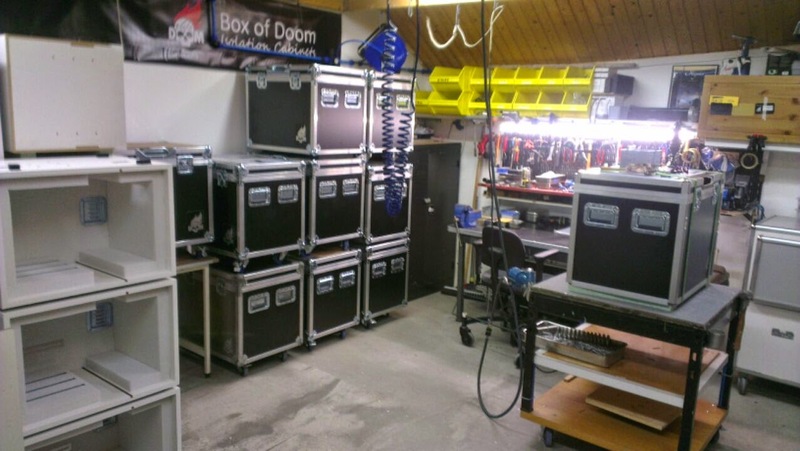 Such as wind, dust, rain (festival shows), We made them an over sized Box of Doom, to be able to fit the Lawson mic and they now have a very controlled situation during the live shows. 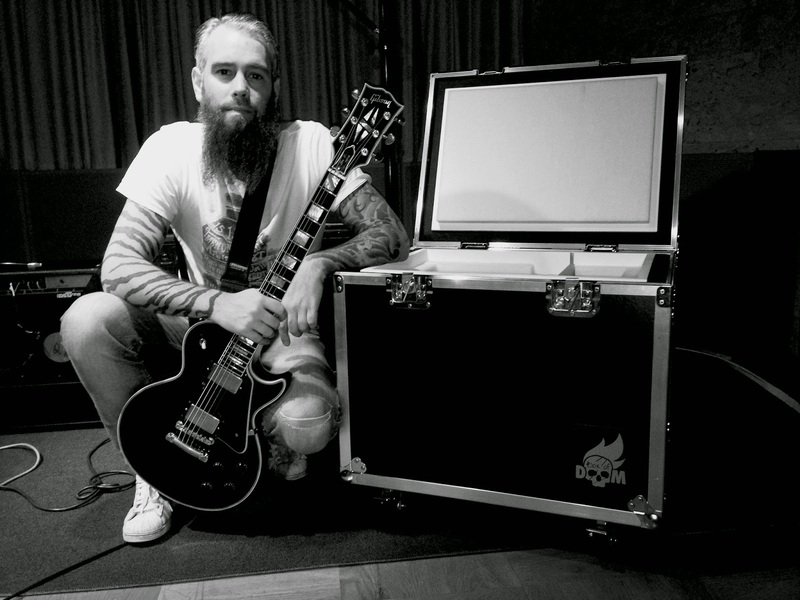 Björn Gelotte and Niclas Engelin in In Flames uses Se Ribbons (Voodoo) for the clean signals and Se4400 for the dirty sounds. I myself, use a combination of a Heil PR30 (large diaphragm), PR22 (dynamic) and a Peluso R14 ribbon. These mics combined are a killer combination. I got inspired by Arjen Lucassen (Ayreon). In the end it is all a matter of taste. And what about the positions inside to get most bottom in the sound if you use two mices? Micing the speaker in the Box of Doom is no different as with micing a conventional speaker. The same basics apply. The center of the speaker is bright and in your face, the more you move to the edge, the more low and less direct your sound gets. 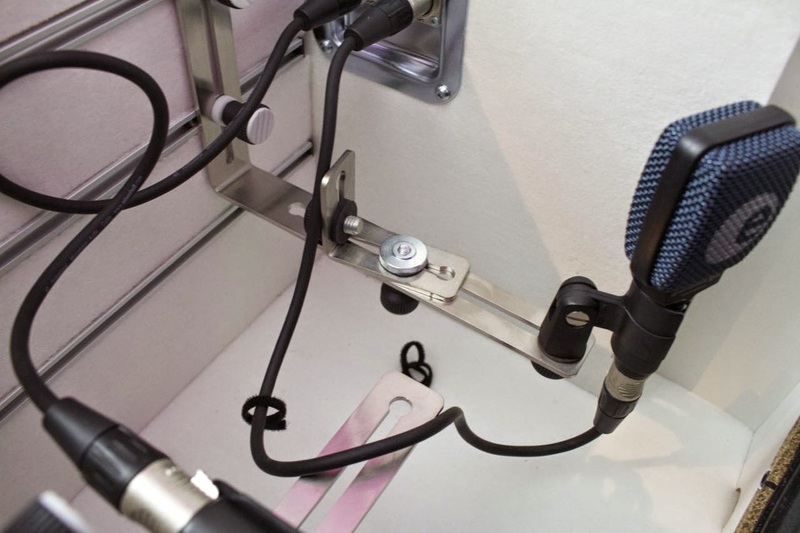 A nice trick is to put your mics of axis, having it pointing slightly outwards or inwards, getting more of the spectrum. Is there any specific adjustments in post production EQ, i mean in Logic for instance? What to should you consider when mixing? The most heard comment of technicians is that the signal coming out the BoD doesn't need much work at all. It is very direct and blends perfectly into a mix. I have been at live tests, where I was standing next to the FoH engineer and they told me they hardly had to eq anything to get a good sound. Rule number one: make sure you produce the sound you wanna record with your gear.. don't try to fix it in the mix.. You can't make a Fender sound like a Marshall, by turning some knobs in Protools.. The speakers you ship is good for different types of sound, can you describe the differences? If you order a Box of Doom, we install a Celestion Vintage 30 | 8 Ohm as default. This speaker is almost iconic / an industry standard, just like the SM57 microphone. Is it the best speaker available? No, probably not but its the standard and it is a speaker suitable for most players. And for most guitarists a good reference. We deliver many BoD units with other type of Celestions, like G12M-65 Creamback (great combi of a V30 and a Greenback). Last couple of years Celestion has been working hard on some new speakers, that are all sounding great. The benefit of the Box of Doom is that you can quickly change speaker, so you can compare easily. For studio's its perfect. You have one BoD and a collection of pre-mounted speakers and you are ready to record every guitarist, metal, blues, jazz..
Are there any other secrets in there? Probably the way how the BoD is constructed is pretty radical. You can't see it, it is all under the skin. If you open the lid, you can feel the weight of it, just like a safe door. It has to be heavy, to be silent, to absorb the resonances.. The construction of the lid is pretty time consuming, but contributes to the quality. When you do quality tests, what is the procedure? All components we get from our suppliers will be checked, before we use them in production. We use over six types of absorption and isolation materials in the product. Density and thickness of the materials are very critical. After we receive the batch from our supplier, we first test (measure) the materials, to make sure the supplier used to correct specified materials. After we wrap up work on the BoD we always first test the wiring, to make sure the connections are soldered correctly. Then we hook up the BoD to an amp and check if the speaker, response is ok. Although Celestion has a qualitiy check, someone could have dropped the speaker during transport, so we need to be sure it works before it leaves our shop. The most common customer, who is that? Artist for live playing, studios or home studio? It used to be 40% pro studio 40% home recording and 20% live.. but since we teamed up with Rammstein, In Flames, Phoenix and many Dutch live acts, we get more interest from touring bands. Recently we added Opeth to the list and there are more to follow. How has it been received by customers? Very good. We have customers all over Europe and recently we shipped to the U.S.
We deal directly with the user/customer. Benefit is that we actually know our customers and get valuable feedback. Whenever a band is on tour, I always get in touch to ask for their experiences. If possible I go over to a show and check out the setup myself. Based on the information, users are very satisfied. As you said many known artists are already using your stuff, are there any new standing on the doorstep? Yes, at this moment we are testing with some known acts. A very known Dutch guitarist and some international (metal) bands. When the festival season starts, I am on the road testing with bands. What is your capacity for meeting the demand? How many can you build in lets say a week? We produce in batches of 12 units. We always try to have at least four units on stock. We finish the units for 90%. Then we leave room for customer specific work, such as 8 pin XLR for tubemic. Or we do a small upgrade to make it ready for bass guitar speaker. We try to have a maximum delivery time of 6 weeks. But most of the time we manage to ship within two weeks. We also make specials, as we did for Rammstein and In Flames, then of course we have a longer delivery time. Any new innovative ideas going on in your head? I will come back soon with a Box of Doom Rundown with sound-clips and much more.